I can see why so many of you are more than ready to show off your fall decor. It is such a beautiful season for decorating. I love all the colors of fall, especially the deep rusts, reds and purple shades. 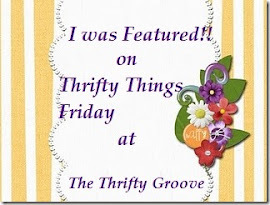 This is my first fall blogging so I am ready to join in and add some fall touches. 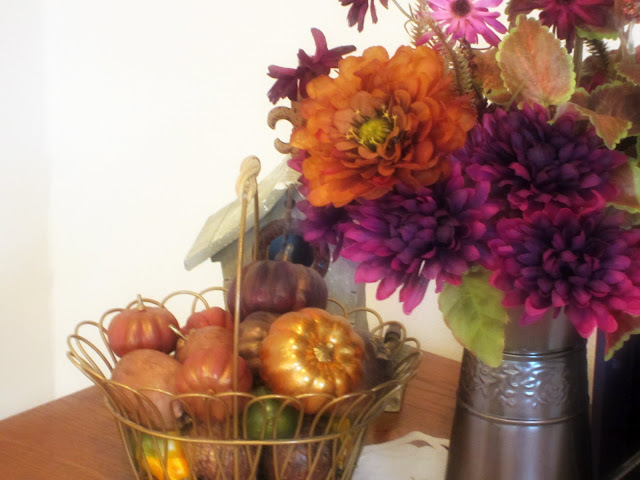 I decided to share my simple fall vignette today. I have an accent table that is a special family heirloom and I added a floral arrangement, basket, plates and a tray I decorated. This table belonged to my grandparents and isn't really my style, but since it is special to me, I decided to use an eclectic mix of decor to give it a vintage look. I don't have a lot of pictures on our living room walls yet, so I decided to decorate a tray as a backdrop for my fall table. 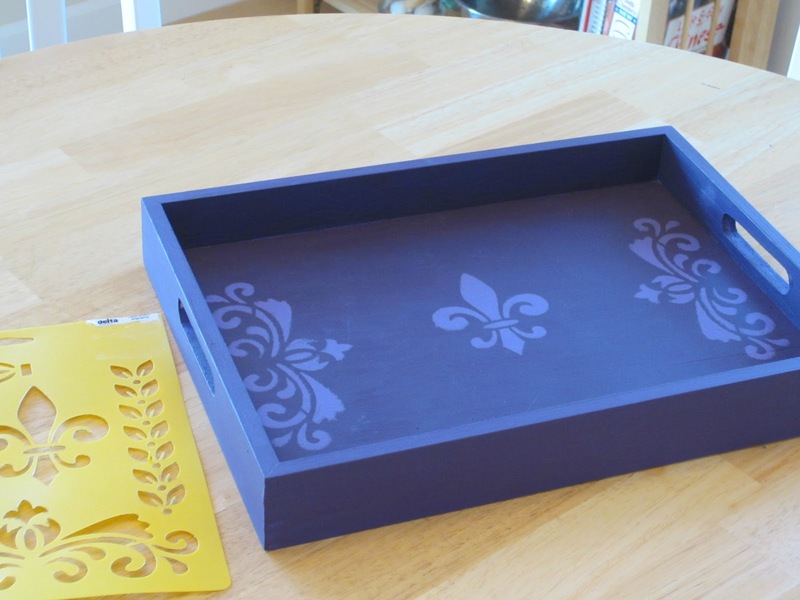 I painted it a purple shade and added a fleur de lis stencil design. I used a cream colored fall plate and a combination of silk flowers and plants. I added a metal pitcher because I thought it added a rustic feel and I like its tall narrow shape. 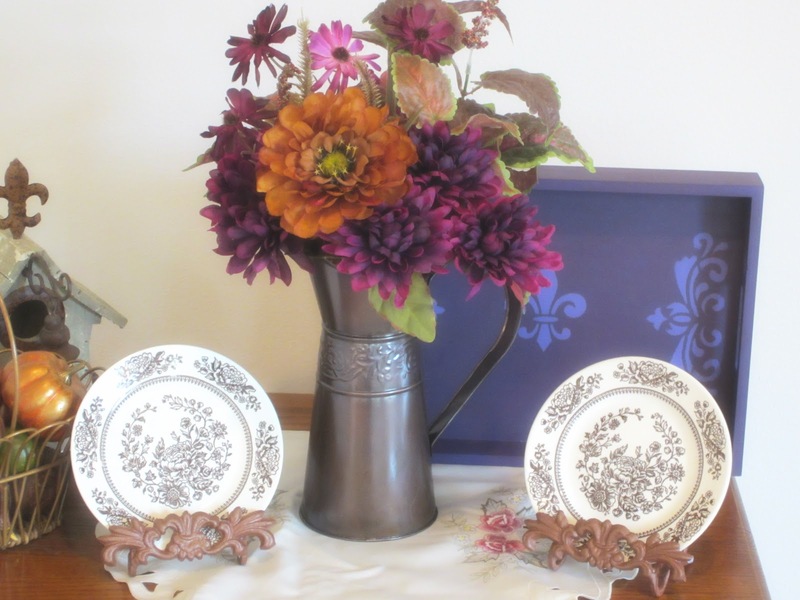 I decided to replace the autumn plate with some vintage floral ones for a different look. I don't think the color or design of the plate holders go that well with the floral design of the plates, so that is something I will change. They remind me of bat wings so I might paint them black and use them for halloween decor! A nice closeup of the fall plate and tray. 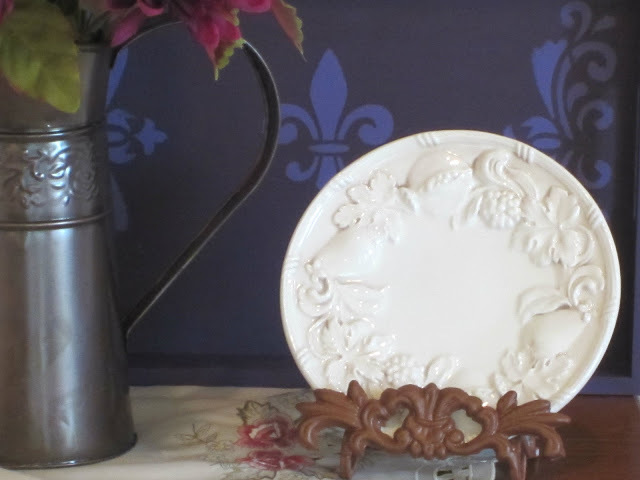 There is an unusual fleur de lis design in the plate holder as well. This pic shows the colors of the flowers quite nicely. I added some pumpkins and wood fruit that I already had to the basket. 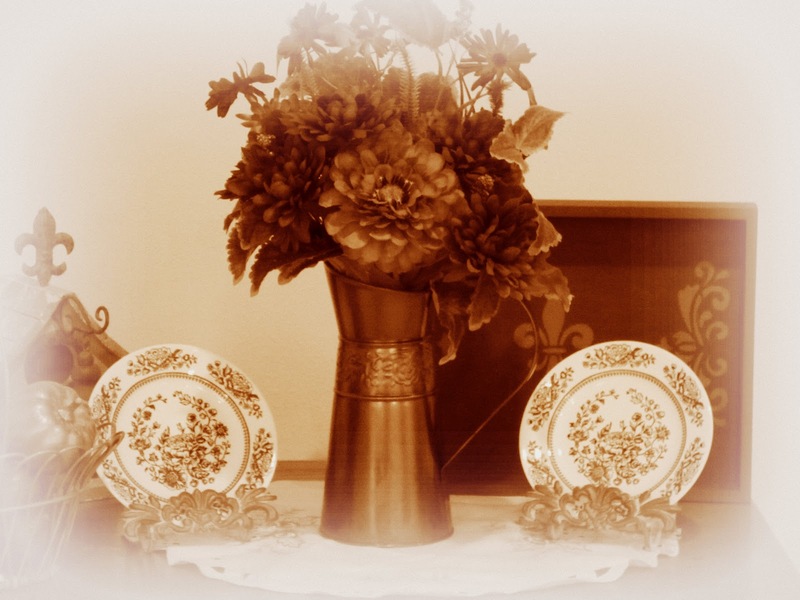 Since I think this vignette has an old fashioned victorian appeal, I decided to end with a vintage sepia picture with my floral plates. I hope you'll stop by again for more fall decor! Thanks for visiting. Comments are appreciated! Diane, you know I'm a fan of this . . .using purple! Love it, love it, love it! 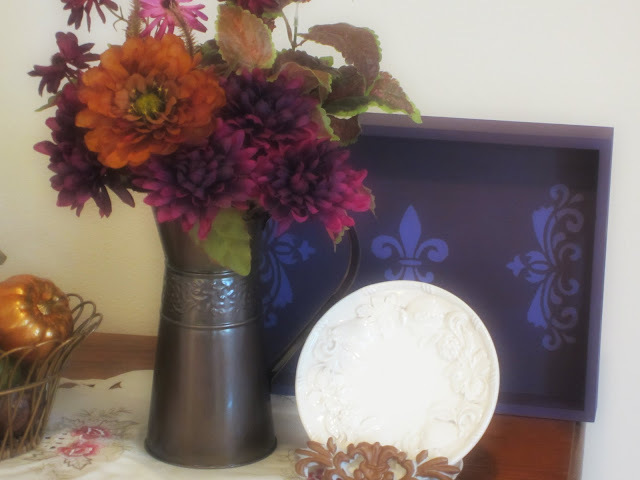 The fall flowers add a special touch to everything with different shades of purple.And I love that you painted your tray purple. The stencil adds to your vintage theme! Thanks Gail so sweet of you to comment. I really like the way the purple tray came out with the stencil too. 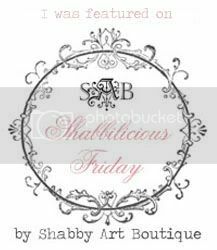 I'll be visitng your blog to see your latest creation! Hello Diane, it's a pleasure to meet you. You have created some great Fall decor. 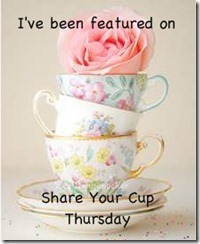 love the flowers and your tray is lovely. Stencils are wonderful for creating great projects. I am your newest follower. I would be thrilled if you came to visit and followed along. 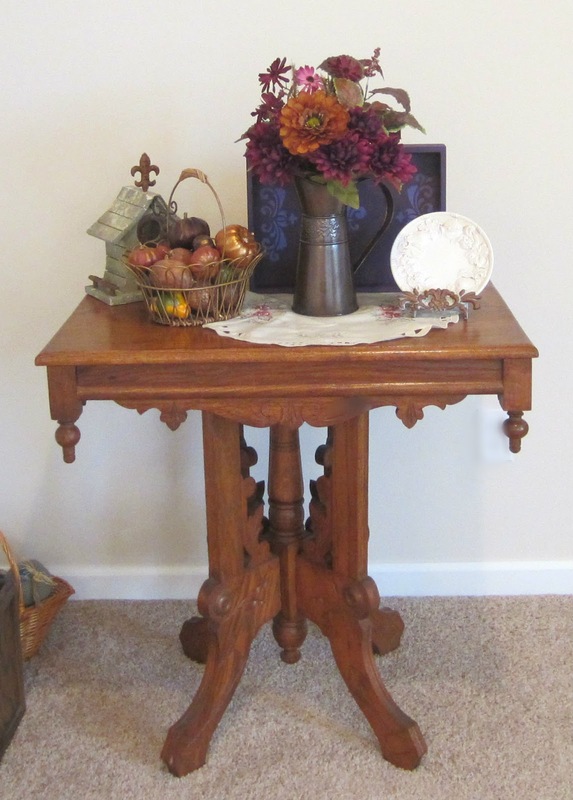 Hi Diane, I love your Fall vignette! Beautiful vignettes. Thanks for sharing. 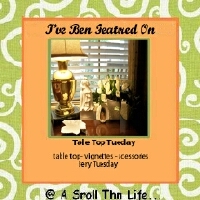 I love that beautiful tray....looks like a lovely shade of lavender! I'm following you now! We 'Dianes' have to stick together! Hugs! 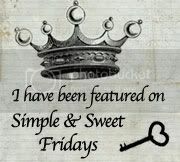 Thanks for following me back and I'm so glad I found your blog. I agree we should stick together and thanks for lovin' my tray!